Be sure to check the preview above for more information. 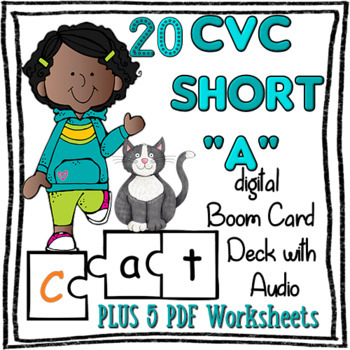 Students will identify the first letter in this Short vowel “A” CVC in this 20 card Boom Deck with Audio. The optional audio is great for emergent readers or students who need extra support to be able to work independently. Each card has a picture of the short vowel “a” word they are trying to complete. 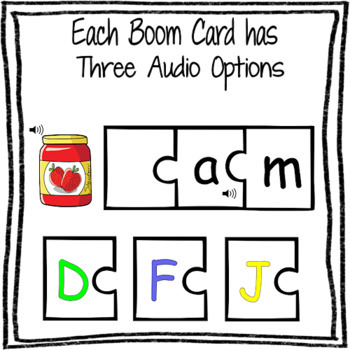 There are three audio clues on each Boom Card. Each card has instructions at the top right corner. Each picture says the name the item the student is trying to complete. Each part of the CVC word such as “-am” is said on the section of the puzzle. It’s repeated twice. 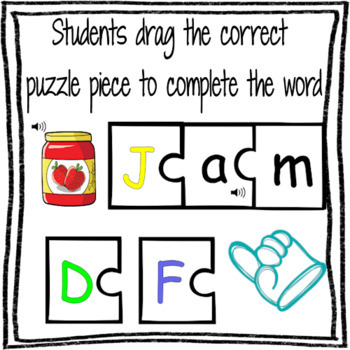 Students drag the correct first letter puzzle piece to complete the word on each card. Reading, Critical Thinking, Spelling and Hand Eye Coordination are covered in this COMMON CORE ALIGNED resource. The learning doesn’t end when the Boom Cards are over! 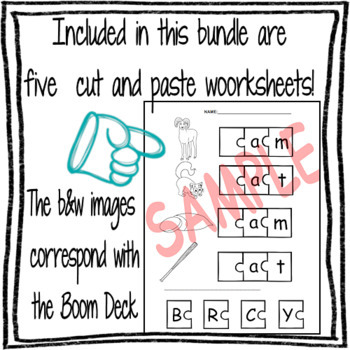 Included in this bundle are five cut and paste PDF printable worksheets that correspond with this Boom card . NOTE: You will download a zip file which will contain a 5 page PDF with a link to download this 20 card deck, which is hosted at Boom Learning. There is a separate zip file containing the five worksheets. You will need to create an account if you do not have one. If you are a new Boom Learning customer, when you redeem your Boom Cards purchase you get a 90-day free trial of a premium account. When your trial ends, you can renew or move to a free account. At the end of the trial, you will automatically be changed to a FREE Starter account unless you proactively choose to purchase a paid membership. Any account (free or paid) can access and play Boom Cards using Fast Pins. Fast Pins do not record student progress, but they do self-grade if the deck is self-grading. Only paid memberships have access to Supercharged Student Success Reports. Boom offers you a 90-day free trial that includes DIY deck creation and 150 students.